Using a mobile app on any smartphone you can check validity, status and information about your license online or offline. Drive your way across the world confidently. Translation and digital copy of your driver's license with no Internet connection required. Possibility of translation into 29 languages. International Driving Authority (IDA) is specialized in translating domestic driving license of any country into 29 languages, and producing an international driving document in compliance with UN standards for document size, color, format, etc. What is the International Drivers Permit? International Driver’s Permit (or International Driver’s License) is a document that allows you to travel anywhere in the world easily and confidently. However, it is supplementary and should not be used instead of your valid country’s driving permit since this is only a translation. The International Driving Permit is legally effective for up to three years. It consists of a plastic ID card, a leaflet with the translation into 29 languages and a mobile application for Android and iOS. International Driving Authority (IDA) is an organization that translates national driving licenses into 29 world languages and provide you with an International Driving Permit consistent with UN requirements for the size, format and colour of the document. How can I apply for an International Driving Permit? We have developed a simple and clear-cut application procedure. Fill in the application form on the site, attach a copy of your valid driving licence, your signature and colour photograph. Then make a payment. You can get international drivers license online here. How to get international driver’s license online? Payment for your International Driver's License application. What driving category should I specify? The categories specified should coincide with those on your driving licence. Will my full name be specified on the International Driving Permit? 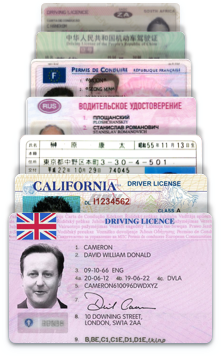 We are obliged to issue an IDP with a name specified on your national driving licence since the document we provide you with is an accurate translation of your driving licence. Can I replace my national driving licence with the International Driving Permit? No, the International Driving Permit cannot replace your national driving licence. This is a complementary document which only serves as your driver license translation. You are still to have your national driving licence while driving a car overseas. Can I pay instead of someone else or use someone’s credit card for making a payment? Yes, you can. However, please, contact us first via email info@idaoffice.org and specify the first name, last name and email address of a person you paid for or vice versa to speed up the process. How can I use my International Driving Permit? Imagine a situation while staying abroad your driving license is not considered legal due to non-compliance. It may really spoil your journey. However, if you decide to get the International Driving License (IDL), it will help you to save time, money and nerves. One of the outstanding benefits of IDL is that it allows you to rent a car all over the world and be sure you won’t face any problems with local police enforcers. Nevertheless, in case the police stop you, do not worry and show your International Driving License and a language translation upon immediate request. Policemen may also ask you to show your valid home driver’s license. International Driving Authority has a secure database containing information about all international permits ever issued. A special mobile application helps you to scan the QR code on each card to find out validity, status and any other information concerning International Driving Permit no matter if you are online or offline. The data are available in 29 languages: English, Spanish, Russian, Arabic, Japanese, Portuguese, Chinese, German, Dutch, Italian, Polish, Ukrainian, Belarusian, Mongolian, Uzbek, Hebrew, Afrikaans, Turkish, Persian, Bengali, Urdu, Hindi, Thai, Vietnamese, Korean, Malay, Indonesian, Tagalog and French. You can pay with your credit/debit card or Paypal. If you pay with a credit or debit card, make sure the email address you have specified is valid. Otherwise, you won’t receive a mail with the appropriate receipt and order number. Payments vary depending on the shipping method, destination and processing time. International Driving Authority offers you three price categories: if you choose 1 year International Driving Permit, it will cost you $39.99. If you prefer to apply for a 2 year International Driving Permit, you will have to pay $54.99. If you want your International Driving License to be valid for 3 years, it will cost you $69.99. How much should I pay for the shipping? Shipping costs depend on your destination. For those who would like to get International Drivers License in USA: if you are based in Continental USA (excluding Alaska and such overseas states as Hawaii for instance and all Insular areas), you can choose USPS service since it is FREE (you don’t need a tracking number). In this case delivery will take 5 to 15 business days. If you choose Federal Express (FedEx) service, within all US states the price will be equal to $35. In this case delivery will take 2 to 4 days. If you are a resident of another country, delivery via FedEx will cost you $35. In this case delivery will take 4 to 8 business days.